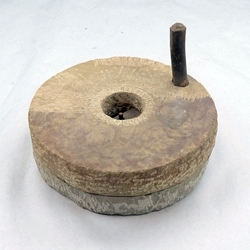 The Chakki is used by pouring the grain in the center hole while turning the handle. This accurate hand mill can be used for Roman re-enacements and throughout the middle ages, for a more realistic camp impression! Sizes, shapes and color will vary.